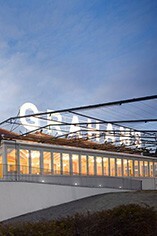 Graham’s wines come primarily from its own Quinta dos Malvedos near Tua and Quinta das Lages in the Rio Torto. Two others, privately owned by a member of the Symington family, Quinta da Vila Velha and Quinta de Vale de Malhadas, also supply Graham with finest quality grapes. All four Quintas are among the best in the upper Douro valley. Graham’s also buys grapes from selected farmers in the finest districts. Some of these farmers have been selling their grapes to Graham’s for generations. Power, dimension and real character are all hallmarks of the 1963 memorable Vintage. Even after many years the Graham’s 1963 never fails to impress with its superbly balanced components of fruit, tannin and elegance. This port wine shows elegant “rose petal” aromas. The flavours are of concentrated caramelised fruit in perfect balance. Peter Symington, responsible with his son Charles for the vineyards and wine making, has been made ‘Fortified Wine Maker of the Year’ an extraordinary 6 times by the ‘Wine Challenge’. Nobody else has won this important award more than once. In 2003, his son Charles won the same award. The Wine Advocate - Graham is another great port house, producing one of the deepest-colored and sweetest styles of vintage port. 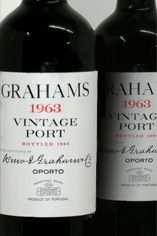 Along with Taylor and Fonseca, Graham has probably been the most consistent producer of great port in the post- World War II era. Their tawnys are quite good rather than exceptional, but their vintage ports are truly sublime and sumptuous. Suckling - This is a monumental wine with a great balance of fruit and tannin. Medium ruby with a garnet edge, enticing nose of bitter chocolate and plums, full-bodied, with chocolate and raspberry flavors, medium tannins and a very long finish. Parker - Graham is another great port house, producing one of the deepest-colored and sweetest styles of vintage port. Along with Taylor and Fonseca, Graham has probably been the most consistent producer of great port in the post- World War II era. Their tawnys are quite good rather than exceptional, but their vintage ports are truly sublime and sumptuous. remarkably youthful and vibrant, classic Graham richness is offset by crisp acidity lingering onto the finish. A brilliant wine now but will develop for 20 years plus. The Graham (Oporto bottled) had an amazingly strong cloves and scented spices nose and was extraordinarily rich and voluptuous, with the alcohol totally absorbed. It is a remarkable wine, so luscious and long lasting.